Some weeks ago a new forum/mailing list was quietly started for and by Puppy translators. After some discussion here in the murga forum, it became clear that we translators need our own space to communicate in. our own channel. A place to brainstorm in and to develop real solutions for the further internationalization of Puppy linux. 1. Finding ways to help and support new and potential translators. 2. Creating a streamlined way to get language packs and their revisions and updates into Puppy. 3. Collecting all useful sources for puppy translators in one place. heartily invited to join the team at Puppy Translators Team! Thanks to moderator Flash for making this thread "sticky". 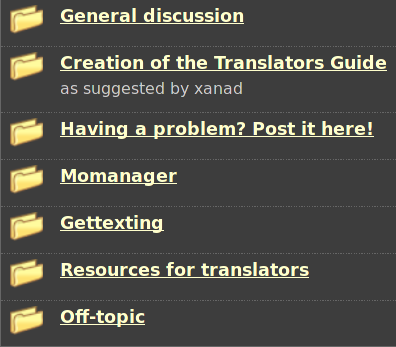 There is a geany plugin named Translation Helper. Did not compile in April64. Thus was compiled in Fatdog64. Copied to April64, pet'ted and uploaded. The pet installs and works in Quirky. Subject description: grey or not grey? Addons and Geanyextrasel to add some general features. Geanymacro adds macros with learning. And Spellcheck.